Mosquitoes transmitting Filariae. Photographic Technique: Page 1. Setup for photographing mosquitoes in profile (Click for wider annotated view). These micrographs were shot as part of a research project on the transmission of microfilarial disease undertaken by Dr. Steve Lindsay, who was then (1982) working at the School of Hygiene and Tropical Medicine in London. The object of the exercise was to take a series of pictures which clearly showed the various stages of mosquito feeding and which would shed light on the way the microfilariae were transmitted from an infected mosquito to a human host. 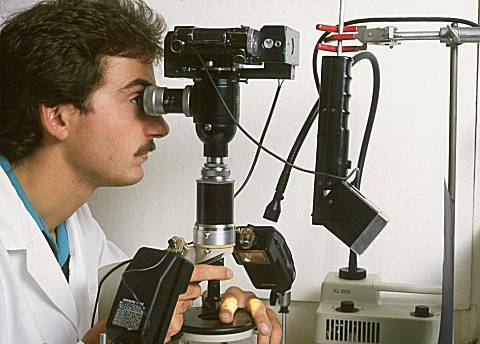 A normal microscope setup would not do, as this is arranged to give a view from directly above, and the head and body of the mosquito would obscure its mouthparts and their point of penetration into the skin. The setup shown below was devised by Micrographia to enable the feeding process to be photographed from the side. Dr. Lindsay using the apparatus. The camera is a Nikon F motor drive with the mirror locked up, fitted to the beamsplitter/focus telescope unit from a Zeiss photomicrographic 35mm camera, replacing the original manual camera body on that unit. Since both shutter release and film advance are controlled by the motor drive, the operator's hands are left free to keep the subject in focus and in frame. The procedure for fitting the replacement camera is described on page 2 of this article. A Meopta adjustable drawtube connects the camera and eyepiece to the Russian Biolam microscope stand via a special adapter having an RMS microscope objective thread in its lower end. The low power objective is a Nikon x1.2/NA 0.03 planachromat. Fitted to the bottom of the objective is a right-angle prism in a rotatable sleeved housing, and focus is achieved by means of the knurled collar of a Beck tubelength corrector between the objective and the threaded special adapter mentioned above. Healthy mosquito feeding on a human finger (x1.2 objective). The camera is fired by means of a footswitch on the floor. The stage of the microscope serves only as a support for the operator's hand which is moved to position and orient the mosquito in the camera frame and also to provide an additional (and more intuitive) means of achieving fine focus. The coarse focus control on the microscope stand is used to raise and lower the line of sight across the stage, and horizontal displacements of the field of view can be achieved by rotating and clamping the optical components in the circular dovetail of the microscope body section. The apparatus could be described as an inverted micro-periscope. 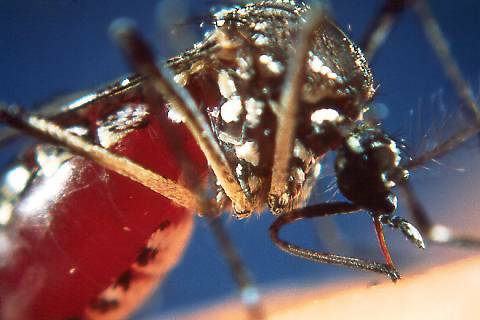 Healthy mosquito feeding on a human finger (x3 objective). Click for an enlargement of the penetrating mouthparts. The light source for the above pictures is electronic flash. The Nikon camera body is synched to a Metz 402 flash by means of a normal synch. cable. The Metz (suspended upside down in the setup picture) illuminates a sheet of blue paper (seen edge-on) which provides the blue background to the picture. Spill light from this unit actuates the photoelectric sensors fitted to each of the smaller flash units on either side of the stage, which provide the specimen illumination. These sensors eliminate the need for multiple connection modules and the tangle of cables which would result. A Schott KL1500 cold light source with a swan-neck fibre optic light guide and condenser provides a modelling light for setting up the shot. A better approximation to the final (photographed) result could have been achieved by using a double swan-neck guide with the condensers placed close to the flash units, but the single guide arrangement proved sufficient. The pictures above were taken during preliminary testing of the setup using uninfected Aedes aegyptii mosquitoes. The mosquitoes, starved for some days before the photo session, were so intent upon their meal that not even multiple flash at close quarters could distract them. The results of the sessions on mosquitoes infected with microfilariae (Brugia pahangi) can be seen by clicking this link. The following page deals with the optical and photographic considerations involved.